We are determined by the Internal Revenue Service to be tax exempt pursuant to IRS Code Section 501(c)(3) (Federal Identification No. 75-2804588.) Consult your accountant for further information regarding the tax deductibility of donations to BRAT. View BRAT’s 990 tax forms, IRS determination letter, and Report of Independent CPAs (period ended September 30, 2013). You can donate to BRAT using a credit card, PayPal, check, or money order with our donation form or send checks, payable to BRAT and mail to: BRAT, c/o Oren Will, 9248 W Purdue Ave, Peoria, AZ 85345-4305. Donations are tax-deductible. 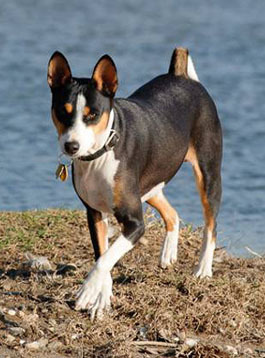 A donation is a great way to honor the Basenji lover in your life. It's a great gift for the person who already has everything. Special occasion and memorial giving is also a thoughtful way to acknowledge an anniversary, graduation, or birthday. Include the honoree's name and address and we'll let them know of your tribute. You shop. Amazon gives. As an AmazonSmile affiliate, BRAT receives 0.5% of the purchase price from your eligible purchases from the AmazonSmile Foundation. There is no cost to you. What better way to help BRAT stay alive and well than to give while you shop. It's easy to get started and bookmark AmazonSmile. If you have any questions about the AmazonSmile program contact us. 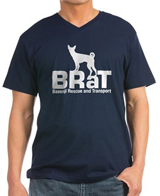 Look cool and support BRAT by shopping in our CafePress store. All items are emblazoned with the beautiful BRAT logo, now in color, black, or white. When you shop with us, all your purchases help us continue our work rescuing the little curly-tailed dogs we love. With Cafe Press, we are are able to offer you exclusive BRAT merchandise you can't get anywhere else. Choose from a variety of t-shirts and sweatshirts for the whole family (including your Basenji), totes, messenger bags, mugs, water bottles, drink ware, aprons, greeting cards, and more! Why get plain when you can tell the world you support Basenji Rescue and Transport! When you hit the site, click on the left sidebar to explore. CafePress offers a 30-day money-back guarantee and most orders ship within 24 hours. SHOP NOW! If you have any questions or concerns about CafePress contact us. What if you could donate a penny to BRAT every time you searched the Internet. Now you can! GoodSearch is a search engine that donates half its revenue, about a penny per search, to the charities its users designate. You use it just as you would any search engine, and it's powered by Yahoo!, so you get great results. Just go to GoodSearch and enter "Basenji Rescue and Transport" as the charity you want to support. It's a free and easy way to help BRAT. Remember to set your default search engine to GoodSearch and to list BRAT as the group you want your searches to benefit. For every search you do, BRAT gets a penny donated to them, and it costs you nothing. If you have any questions about GoodSearch contact us. You can donate to BRAT using a credit card or PayPal account through Network for Good. The best part is you can set up recurring monthly, quarterly, or annual donations. This trusted and secure site keeps a record of your donation history, which makes life easier for you at tax time or when you want to give again. Network for Good just makes it super easy to give to our Basenjis in need, whether you give once or set up recurring donations. You will need to create a login account and the minimum donation is $10. Network for Good does not process checks. This site has a robust knowledge base of questions and answers, just click on the site's help link. If you have any questions about Network for Good contact us. PayPal Giving Fund (formerly MissionFish) is the way to fundraise on eBay. The combination of their technology and nonprofit expertise, plus eBay's active global community, forms the eBay Giving Works program. It allows sellers to give proceeds from their sales to a favorite nonprofit, and helps nonprofits raise funds by selling on eBay too. Nonprofits can also receive donations from eBay users through the Donate Now feature, which lets anyone with a PayPal account donate to nonprofits right away—without buying or selling anything. Use our link to buy, sell, or donate! If you have any questions about PayPal Giving Fund contact us. WDJ is your guide to natural dog food, dog care and dog training! Let Whole Dog Journal show you the all-natural way to a happy, healthy dog! Unlock the natural secrets that trigger better behavior and improved health in your dog! Whole Dog Journal guides you step-by-step through the latest natural dog health remedies and positive dog training tips and techniques that are proven safe, gentle, and effective. Get the deal here. If you have any questions about The Whole Dog Journal contact us. Don't just take your dog for a walk ... Take your Walk for a Dog! Support your local animal organization simply by walking your dog! Use the app each time you grab for the leash. It’s healthy for you, your dog, and your favorite shelter or rescue. Every Walk for a Dog counts, whether it's a walk around the block or a three mile hike. Magnify your impact by sharing the app with your friends and family. Consider making a personal gift to the shelter or rescue you are walking for—right through the app. The more people actively walking with the app, the greater the benefit to your selected animal organization! Download the app here. If you have any questions about WoofTrax contact us. If you need help, information, or have questions about BRAT, call our toll-free number at 877-488-7328. Or read our FAQ about making donations. And why not remember BRAT in your will or trust. If you would like to know how easy it is do this write to us.